Man, I wish I could live in Europe. This kind of stuff is incredible. And the craziest part is that you can DRIVE here. And there’s TONS of spots just like it! Really, it’s just not fair. I’ve noticed that a lot of readers are from Italy. You guys don’t realize how lucky you are. 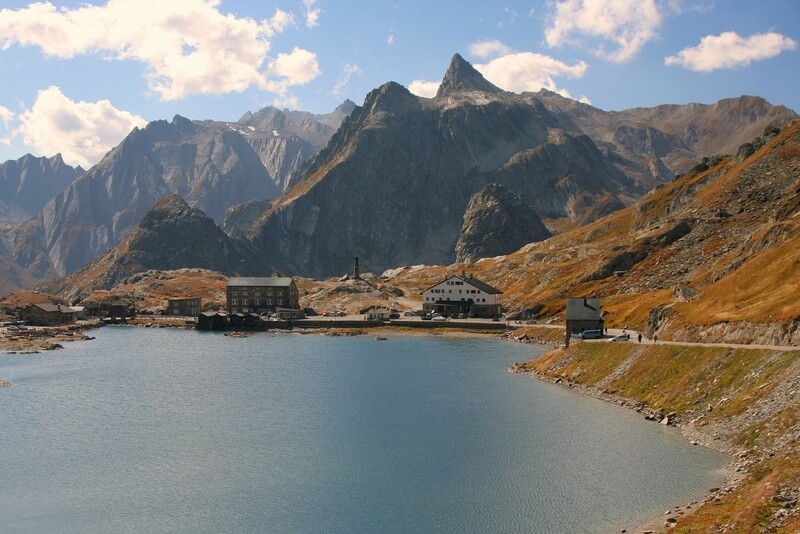 This is Grand St. Bernard pass, which lies along the Italy-Switzerland border. This was taken just on the Swiss side, looking back into Italy. The building on the right is the Swiss guard station, and the other two buildings are Italian hotels. There’s also a hotel on the Swiss side, behind me. We were there in early-mid September, which was perfect, since all of the grass and such was a brilliant gold color once you got up above treeline. I’m sure it’s beautiful *any* time of year, but in the autumn it was especially so. I wish I could have had more time there, I would have loved to stay in one of those hotels and just spend a few days hiking in whatever direction caught my fancy each day. But, I sadly only had about 6 days total for driving around and exploring, and this was the last night we had before we had to start bee-lining it toward Venice. Sigh. Next time, next time. There are two Saint Bernard passes, Grand and Little. Grand (this one) is 8000 feet high, and as I mentioned goes between Italy and Switzerland. Little is about 7000 feet high, and goes from Italy to France. Both of them are accessible from the Aosta valley in northwestern Italy, which is capped at the end by Mont Blanc (Monte Bianco). I would have liked to have been able to drive both of them, but the timing just didn’t work out. As you can tell, the view was a bit hazy looking back into Italy, since this was taken looking south, and it was mid-afternoon. The view north (into Switzerland) had better light (and I got plenty of pics that direction too), but the quality of the Alpine views was spectacular no matter which direction you were facing. When I was there, I only had one lens with me, which is my 28-300 mm all-purpose whiz-bang best-thing-since-mayonnaise lens, which works for just about everything, but, since it starts at 28mm, I lose a lot on the wide-angle end. I’ve been thinking a lot lately that having a more wide-angle lens at least handy would be cool, as here it may have helped me get a nice shot that included the whole lake in the frame, as well as the mountains. I’m intending to steal back the 18-55 that came with the camera from my buddy Dan who is borrowing it, but I’ve also tossed around the idea of getting something even wider, but that would require spending some cash, which is never fun. (Except when it is.) We’ll see, that’s still an open question. I do hate the inconvenience of swapping lenses (which is why I’m so fond of my 28-300), but lately I’m realizing that it might be an impossible dream. Oh well. Update: Oh, forgot to mention… Grand st. Bernard pass is where monks traditionally have, and still do, breed st bernard dogs for … All the things that you would normally breed such a dog for. Like carrying your booze for you. Notes: Canon EOS Rebel XT, Tamron 28-300 mm lens. 1/200s, f/6.3, ISO 100. Focal length: 32mm.